Four years ago, my colleague Scott Steketee and I set out to develop an interactive game to help students develop strategies for thinking about and solving multiplication problems. As we examined the existing apps on the market, we discovered that most focused on the drill aspect of learning one’s multiplication facts. We set our goals higher. We wanted students to become confident in facts up to 12 x 12, but this fluency needed to develop through visual models that stressed the conceptual aspects of multiplication. Bunny Times uses carrots in a field to represent the array model of multiplication. In the first few levels, students determine the total number carrots in the field and a single bunny eats them all. Some students may count the carrots one by one, but soon, a patch of fog rolls in, obscuring many of the carrots. In later levels, bunny teams eat carrots in unison, with students able to specify the number of bunnies in each team. These game elements lead students to develop new strategies for thinking about multiplication, such as skip counting, adding on, and deconstructing problems like 7 x 8 into (5 x 8) + (2 x 8). When we released Bunny Times in 2013 as part of the NSF-funded Dynamic Number project, you needed to either own Sketchpad or proceed through a multi-step installation process on the iPad to play it. Now, however, Web Sketchpad makes everything simple: You can play Bunny Times in your web browser by clicking the picture below. If you tap the ‘Learn to Play’ sign post on the opening Bunny Times screen, you’ll be taken to a video that gives an overview of the game. If you’d like to read about the pedagogy behind the game and a mathematical overview of each level, download this document. Have fun and share with us your experience of using Bunny Times with your students or children! 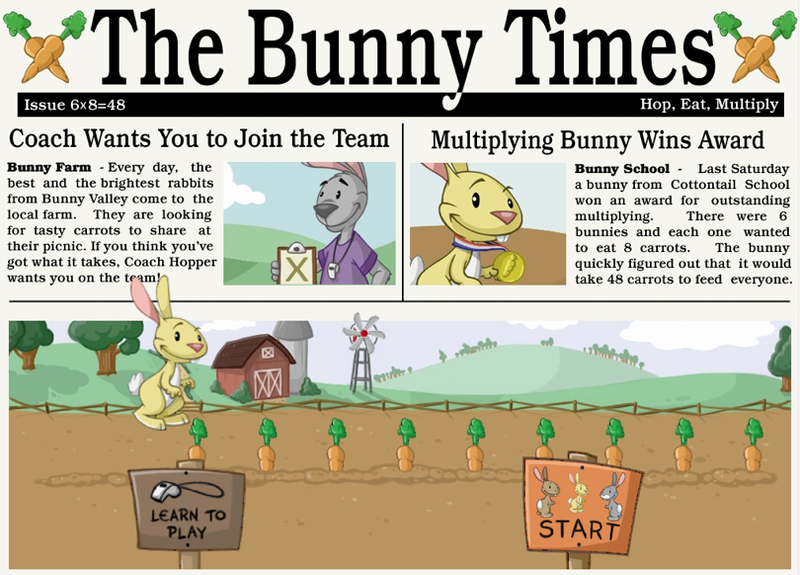 UPDATE: Bunny Times is now available to play on the NCTM Illuminations site as well. Yes, this was on my list of things to look into for my 7 year-old daughter after I read Tracy’s post. So nice to see that it was made with WSP!